Are ready to have fun! In fall, Color guard performs as part of the whole band ensemble, marching on the field at half time of Acton Boxborough football games. Together with the rest of the band, Color Guard also participates in select parades around the state and competes in the Massachusetts Instrumental and Choral Association (MICCA), Marching Band semi-finals and finals each year (usually in October). In winter, Color Guard truly comes to life! The team rehearses and performs a choreographed routine, that combines dance, mastery of equipment (flags, rifles, sabers), and likewise integrates the use of props and costumes to produce a stunning visual display. The team perfects the routine at regional weekend competitions throughout the winter, then competes at the New England Scholastic Band Association (NESBA) finals at the end of March. 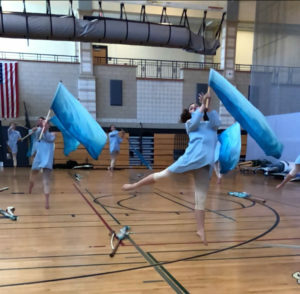 Acton Boxborough Winter Guard competes in the Local Scholastic A division. Recruiting for fall 2018 is starting now, so check back for information about our information session coming soon. Meanwhile, if you have any questions or are interested in joining the team, please contact band director, George Arsenault at GArsenault@nullabschools.org.